As shown last week, we are super excited about the arrival of the new First Edition dies so to help get your creative juices flowing, Maxine is going to take you step by step to create three gorgeous projects made with these retro dies! 1. Die cut 4 of the square frames from the First Edition Photo Frame dies set onto your chosen First Edition Floral Fusion 12x12 paper pad. 2. Adhere Dovecraft Acetate to the back of all 4 frames with Dovecraft Perma Fix tape. 3. Cut 4, 2cm x 7cm strips of Floral Fusion paper. With the strip horizontal, measure up 1cm and score a horizontal line. Fold your strips in half. 4. Adhere the strips to the sides of the frames with Dovecraft Perma Fix tape. Stick the frames together to create a box shape. 5. Cut an 8.5 cm square of paper, measure in 1cm on each side and score a horizontal line. Make 4 small cuts to the 1cm mark, 1 on each side. Fold the sides along the score lines and adhere the corners. Add tape around the edge. Place into the bottom of the box and adhere into place. 6. Cut 2, 6.5cm squares of coordinating Floral Fusion paper. Add small foam pads to 3 edges. Slide into the box, adhere behind the acetate. Add the second piece to the opposite side of the box. 7. Cut 2 further pieces of 6.5 x 6cm Floral Fusions paper, adding 3D foam to the edges, ensuring to leave one of the 6cm sides free. Adhere each piece to the inside of the box. 8. Slide your favourite photos into each side. 9. Optional to make a lid cut a 9cm square of paper, repeat the same as the bottom of the box to make the lid. We love how cute and dainty these photo frame boxes are! They’re perfect for holding a selection of your favourite photos and by changing the paper design, you can make them for different occasions! Showcase your sunny snaps from your holiday, wedding pictures for a friend or a create new baby gift for a loved one. 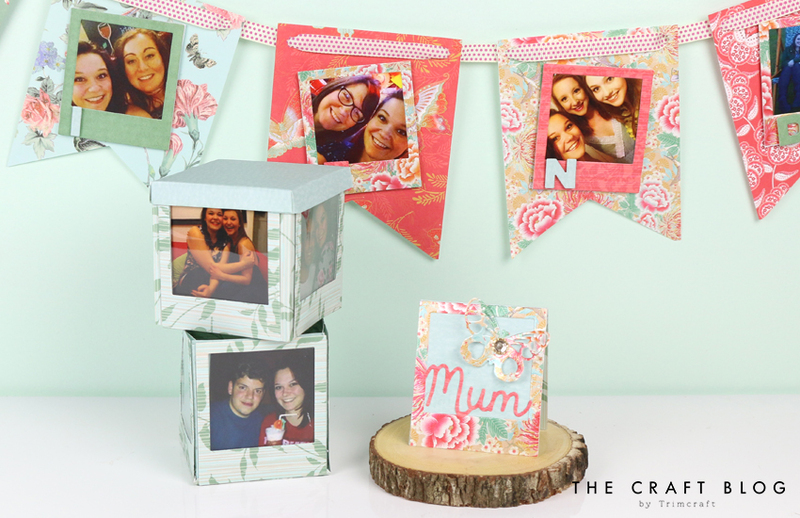 Alternatively, you could create photo bunting with the same die! Simply die cut your frames, adhere your photos to the back and stick them to each flag. This would be wonderful for decorating your bedrooms, especially for University students looking to make their room more homey! You could also make the cutest place card or gift card by adhering the die cut photo frame to the front of a folded piece of card! Simply add your chosen sentiment or name and add a little embellishment to make this little project stand out! How will you use these new First Edition dies? We’d love to see so don’t forget to share your makes in the Inspiration area and to #trimcraft when uploading to social media.